The cover is revealed! 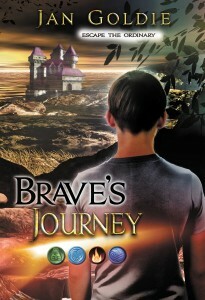 Here’s a sneak preview of my brand new children’s fantasy adventure Brave’s Journey. It’s magical, it’s shiny and new, it’s actually happening! When Brave woke up that first, life-changing day, he had no idea that pretty soon he’d be controlling the weather, talking to royalty and journeying to another world. Let alone riding a camel. Life in the mysterious world of Arvalonia, where magic springs from the nature around you, couldn’t be more different to his ordinary existence back home. Especially when he meets True… bossy, rich, driven teenager True who’s out to make his life a misery. Brave and True venture deep into enemy territory; facing a month without a bath, nipping stinkbuggies, evil ruler Mallevia’s ruthless green guards and eventually a battle with the vile queen herself. Discover a place where the nature of power is within the power of nature. Escape the ordinary. Thanks to Gerry Huntman of IFWG and Elizabeth Lang of EL designs for a wonderful job. The full version is gorgeous, with the art work wrapping around the spine and continuing on to be the background of the back cover blurb. It’s going to be a lovely book to hold in your hand! I particularly like the four elements sitting just below the title. What do you like about it?